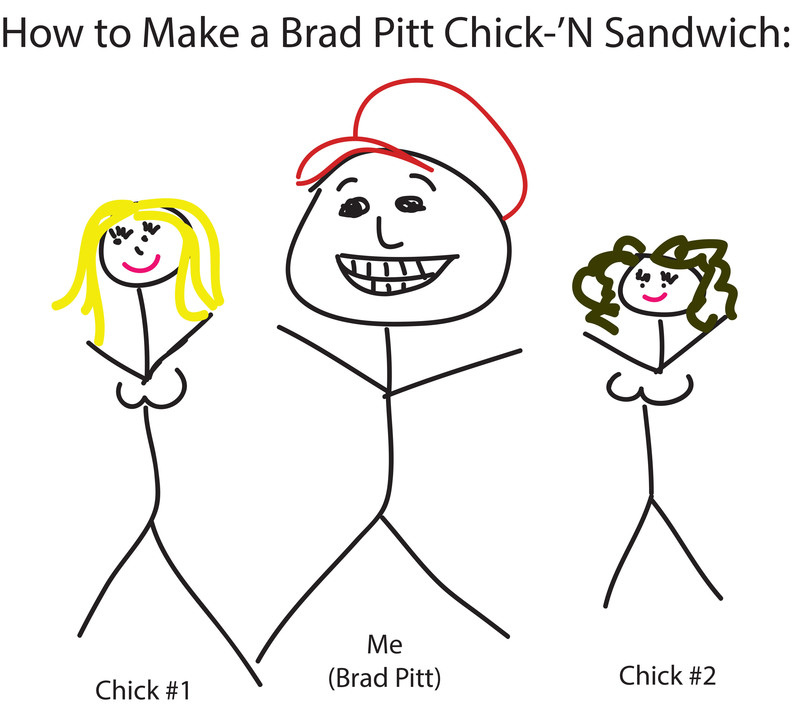 I have to work today, so I asked Brad Pitt to guest blog about Sandwich Saturday for me. I can only imagine what this could lead to, but I’m sure we are all in for something interesting …..
Hi Everybody! It’s Brad Pitt. Yes, I know Katie usually posts on this thing, but it came to my attention that she had to work. So, I’m taking over as a guest blogger to post my own suggestion for the national (global? universal?) holiday that she has created: Sandwich Saturday! Step 1: Find 2 chicks– as in super fine ladies. Step 2: Convince them to let you ‘N between them! Step 3: I’ve never actually gotten past Step 1, so you will have to improvise. This entry was posted in Sandwich Saturday and tagged cartoon, Chicken, Chicks, food, humor, Ladies, Sandwich, Sandwich Saturday. Bookmark the permalink. That looks like a Sister Sandwich to me. Bah ha ha ha ha!!!!! I kinda thought the same thing.. That’s kinda weird Brad Pitt… Just sayin. Oh wow…makes me miss seeing the both of you in one location. Rain check soon!!! !